Coral Pink Sand Dunes State Park is a state park of Utah, USA, located between Mount Carmel Junction and Kanab, south and west of U.S. Highway 89 in southwestern Utah. 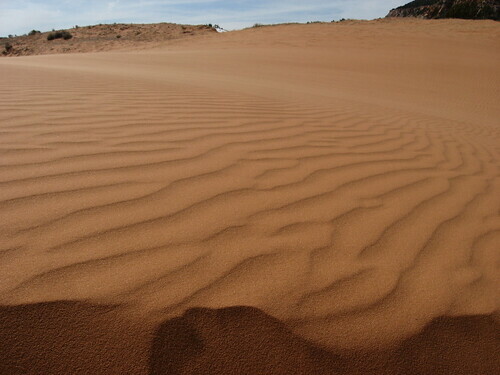 The park features coral-hued sand dunes located beside red sandstone cliffs. The Dunes are formed from the erosion of pink-colored Navajo Sandstone surrounding the park. High winds passing through the notch between the Moquith and Moccasin Mountains pick up loose sand particles and then drop them onto the dunes because of the Venturi effect. The dunes are estimated to be between 10,000 and 15,000 years old. The park allows camping, hiking, off-road vehicle driving, and photography. There is a conservation area of 265 acres (1.07 km2), and the total grounds include 3,370 acres (13.6 km2). It was established as a park in 1968.